Diane Dorsey is a metalsmith from a town near Santa Fe, New Mexico. I first saw her work in person at Metalmark, a fine jewelry store in Denver, and was immediately drawn to her rings. They are beautifully crafted and easy to stack. They are also easy to wear because they have an organic texture and a soft matte finish. The stack that stuck with me included imagery of an egg, a clover and a staurolite. Diane shares her inspiration behind these designs below! This year I’ve been thinking a lot about the role luck plays in our lives. As we all do I believe. What is it? Does it exist? Is it a just a meaningful coincidence? Many of my new pieces are inspired by luck, and its symbolism in many cultures. 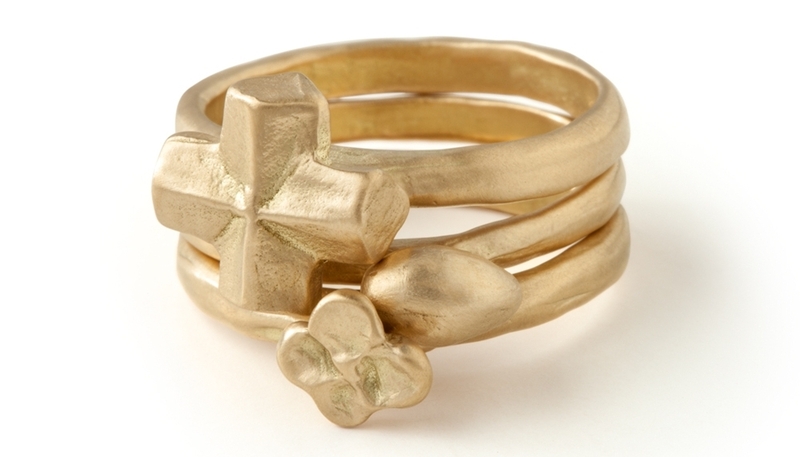 This trio of rings is my talisman of luck, prosperity and abundance. I draw a lot of inspiration in my work from minimalist artists of the ‘60’s - one of my favorites is Agnes Martin, whose studio and home was just down the road from where I lived in Galisteo, New Mexico. Like Martin, I look to nature to inform my expression of the purity of everyday life. And, as an architect, as well as an artist, I’m drawn to sculptural simplicity for its honesty and clarity of form. I have a long and winding obsession with the egg. I’ve always been drawn to the form…it’s elegant and simple lines, and the myriad of egg shapes varying with each bird. And, beneath it all, it’s deep symbolism. For me, it’s the ultimate symbol of birth and creation, fragility and strength. I first came across a staurolite on a visit to Taos, one of the few places in the world where they can be found, deep in the Sangre de Christo mountains. Struck by its pre-historic nature but ultimately, its modernity as well as its symbolism as a talisman of luck, I began to collect and then use them in my antique beaded work. I cherish the originals as a muse for carving my own staurolites out of sterling silver and 18K gold. As a child growing up in Ohio I used to lay in the vast fields of clover surrounding our home and search endlessly for four-leaf clovers. They represent a deep attachment to ‘place' and peace of my childhood. I’m ever grateful and elated for the trip from ‘there’ to ‘here,’ and of the simple beauty of a four-leaf clover. My signature stack, rendered in gleaming noble metals, with shapes symbolic of good fortune become a nested trio of tangible affirmations.